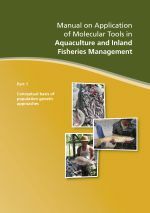 The farming of the giant freshwater prawn has expanded rapidly in Thailand in recent years. Production has increased from less than 3 tons/year in 1976 to an estimated output of more than 1,200 tons in 1982. This rapid growth was largely stimulated by the Chachoengsao Fisheries Station established in 1976 to solely promote culture of the prawn. 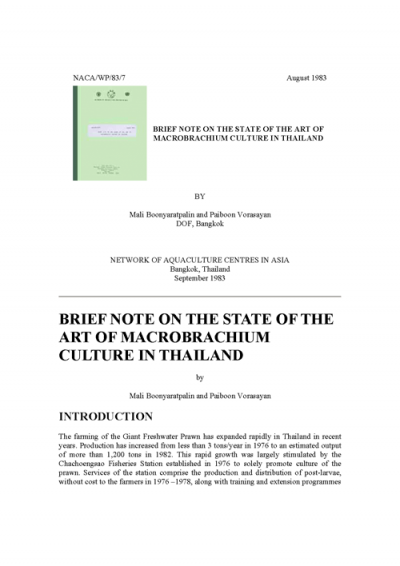 Services of the station comprise the production and distribution of post-larvae, without cost to the farmers in 1976-1978, along with training and extension programmes on all phases of Macrobrachium culture. During the initial period of 1976-78, postlarvae were distributed to farmers free of charge. The assistance of UNDP/FAO in 1979-1980 has also contributed much to its rapid expansion. The station has increased its post larvae production from 5.6 million in 1979 to 15 million in 1982. The number of farms and acreage have also increased, from 306 farms with a total area of 300 ha in 1979 to 677 farms of 1,737 ha by 1982. Thailand is still importing some Macrobrachium, about 700 tons/year chiefly from Burma, but at the present rate of growth, domestic demands will soon be met by local production. Current practices and the improvement made in the culture system in Thailand are reviewed below.